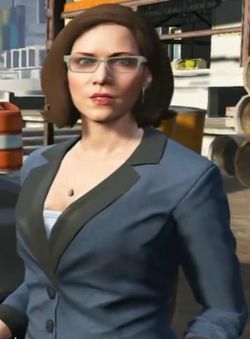 Molly Schultz is a character in the HD Universe who appears as a minor character in Grand Theft Auto V. She is voiced by Elizabeth Mason. Molly is the right hand woman of Devin Weston, serving as the senior vice president of Weston's holding company as well as his legal counsel. She has a rather cold and no-nonsense business attitude; however, she becomes hysterical if she feels her life is in danger. Molly is introduced to Franklin Clinton, Trevor Philips, and Michael De Santa when Weston wants the three to steal two exotic sports cars from two trust fund kids he dislikes. Trevor tries to flirt with Molly; however, she mostly ignores his advances. When the trio returns with the two cars, Molly gives Franklin and Trevor a briefing on their next car. When Franklin, Trevor, and Lamar Davis deliver the cars they procured, Franklin attempts to get their payment; however, Molly tells him that Weston is investing the funds and will release them when he sees fit, causing Franklin to believe that they are being robbed. As Solomon Richards is about to finish the film Meltdown, Weston tells Solomon and Michael that they are going to pull the plug on the movie to collect a massive insurance payout, thanks to Molly's understanding of the insurance policy. Solomon reluctantly gives the film to her and she leaves for the airport. Not wanting to see his work destroyed, Michael chases after her in a high speed chase on the tarmac of Los Santos International Airport. When Molly reaches Weston's personal hangar, she runs in a panicked fashion towards the main bay, where a jet's turbine is running. The engine's vacuum causes Molly to drop the film, and she is sucked into the turbine and killed instantly, leaving only a bloody mess across the hangar's floor. When Michael finishes Meltdown, Weston sends a squad of Merryweather mercenaries to murder Michael's wife and daughter as revenge for killing Molly; however, Michael successfully thwarts the attack and saves his family. I know your schedule is crazy today so if you miss dinner feel free to stop by my place and I can give you something.